Your North Myrtle Beach vacation at Arcadian One will be full of fun in the sun, enjoying exciting attractions and entertainment, playing championship golf, dining on fresh seafood and reveling in the comfort and amenities offered by this outstanding North Myrtle Beach resort. This oceanfront North Myrtle Beach resort is located in a quiet beach neighborhood but is only minutes away from all of the hustle and bustle of the Grand Strand. Come to North Myrtle Beach and take advantage of all the perks that come with staying at a top-of the line oceanfront resort and return home from your South Carolina getaway relaxed and refreshed—and with a golden suntan! Arcadian One offers two-, three- and four-bedroom vacation condos, so no matter the size of your group, we have the ideal accommodation for you! Whether you are traveling as a couple on your honeymoon, a small family, a golf group or a church group, Arcadian One has something to suit you. Each of our oceanfront vacation rentals comes with a fully equipped kitchen. Even though North Myrtle Beach has a huge restaurant selection, you are likely to want to eat at least a few meals in, and the nicely-stocked kitchen will allow you to do just that. Many of these condos have both breakfast bars and dining tables, making it easy for everyone to eat together. Each condo is also equipped with wireless Internet access which will make it easy to keep up on what is happening outside North Myrtle Beach. If you have not made advance tee times, gotten tickets to North Myrtle Beach events or made dinner reservations you will appreciate being able to do this from the comfort of your Arcadian One vacation rental. If gorgeous ocean views are what you are looking for while on your North Myrtle Beach getaway, you will have them at Arcadian One. Our vacation rentals each have their own private balconies with glorious ocean and beach vistas. Morning is a wonderful time to be out on the balcony as the purple and orange hues of the sunrise flicker over the waves. The balcony is also a nice place to gather at the end of the day for a nightcap as the moon lights up the sky. All the comforts of home are offered at Arcadian One. As you drive up, you will notice that there is plenty of parking, and our overnight security will help keep not only your vehicle but your family safe. The convenient elevator will be a blessing as you are unloading your belongings to take up to your oceanfront condo. There is nothing worse on vacation than having to search the area for a laundromat—and when you stay at Arcadian One you will not have to! On-site laundry facilities are provided for your convenience, so you can pack lightly for your North Myrtle Beach vacation. If you like to cook out, take advantage of the barbecue/picnic area at Arcadian One—there is nothing better than dining outdoors in your bathing suits as you watch the kids playing in the surf. This North Myrtle Beach resort is a wonderful place for fishermen. The anglers in your group will love being within walking distance to an ocean fishing pier and having access to a seven-acre fishing pond. 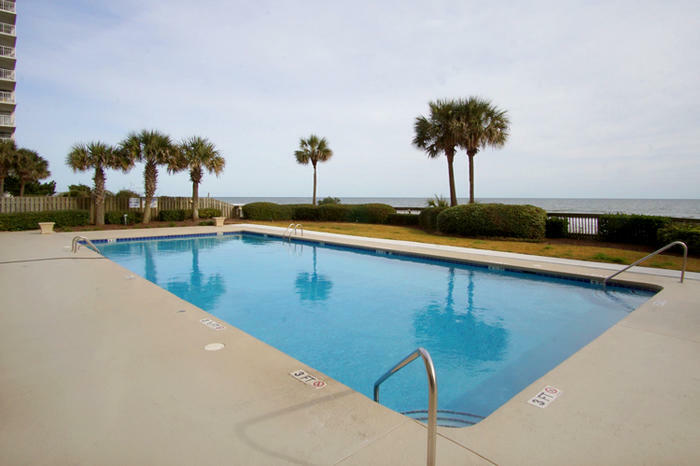 In addition to having a lovely swimming pool surrounded by plenty of lounge chairs, the beach is just steps away from Arcadian One, making it easy for you and your guests to enjoy all of the water sports activities that a North Myrtle Beach vacation is known for. You can anticipate even more perks when you reserve a North Myrtle Beach vacation rental at Arcadian One, including a game room, an oceanfront gazebo and lighted tennis courts! The Shore Drive location of Arcadian One puts its guests close to all of the North Myrtle Beach golfing, restaurants, shopping and entertainment. These North Myrtle Beach condos are just five minutes from Barefoot Landing, a popular spot for live entertainment and shopping. Restaurant Row is just down the street and features some of the best North Myrtle Beach restaurants. The Myrtle Beach Mall is just a short distance away, as are two popular outlet malls where you can find great bargains to take home from North Myrtle Beach. The Grand Strand, MyrtleWaves Water Park, Family Kingdom Amusement Park and more than 100 golf courses are just around the corner from this North Myrtle Beach resort. In addition, there are many spots nearby to grab a burger, take a snorkeling lesson, get some ice cream, join a dolphin-spotting cruise or enjoy a live dinner theatre. Stay close to all of the North Myrtle Beach, South Carolina excitement—stay at Arcadian One!